Before she was part of Kris Demeanor's crack bank and a songwriter in own right, Chantal Vitalis was a big part of the jazzy Same Difference. Special thanks to: Syntax Arts Society, Sue (Westward Club), Rita (National), Tania (Studio a Go-Go), VOX, CJSW, James Muretich, Scott Willing, Kerry Clarke, Anne Loree, Patty Lynn, Alexander Thomas, Robert Cuffley, Richard Harrow. Thanks to all those who have helped and supported us over the past 3 years. Another one courtesy of Mr. David Veitch. Thanks yet again! 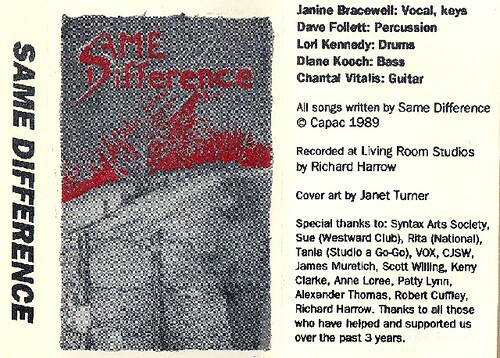 I met Janine in Vancouver in the early '90s, she jammed with my band a few times... helluva voice. I must have seen them five or six times, usually at the Westward Club. What a great surprise to find them here today! Heaps of thanks to CCPS for their outstanding work keeping great analog music alive in these digital times... Sooo many thankyou's!!! Can't believe I found this. Thanks for the link to Soundcloud. Fantastic cassette. Brings back lots of memories of Calgary clubs. I found a cassette player for 5 bucks and dug out some old tapes, and found this precious gem. I used to see Same Difference all the time at the Trading Company in Lake Louise when I worked there from 1988-1992. So so good, love it.